I’m a case study junky. Whenever I have a recommendation for clients, I instinctively try to find pertinent case studies that can support my proposal. They aren’t a magic bullet. Clients can always find reasons to say, “Well, that doesn’t apply to us for reasons A, B, and C,” especially if my proposal takes them outside their comfort zone, as social media sometimes does. That’s why I was happy to learn of CaseStudiesOnline, created by Tod Maffin. You can search and find links to social media case studies sorted by demographics, industry, organization and tactics (i.e. social media tools used). Tod also invites users to add their own cases studies, which means this resource is likely to grow in relevance and usefulness over time. I would love to see a function that allows users to rate the case studies for usefulness. For these and other suggestions (from you perhaps) Tod provides a feedback link. Talk about nerdy new year’s resolutions. One of mine is to start getting a deeper understanding of social media monitoring tools and methods. Measuring the effectiveness of social media, and in particular the whole question of ROI, is a topic that appears to be heating up in 2010 now that social media has garnered broad scale awareness among marketers as a phenomenon they need to reckon with. Frankly, the range of tools, services and providers is a bit overwhelming. So I’m starting small, with the free tools. Also, social media tracking is the category of most interest to me. 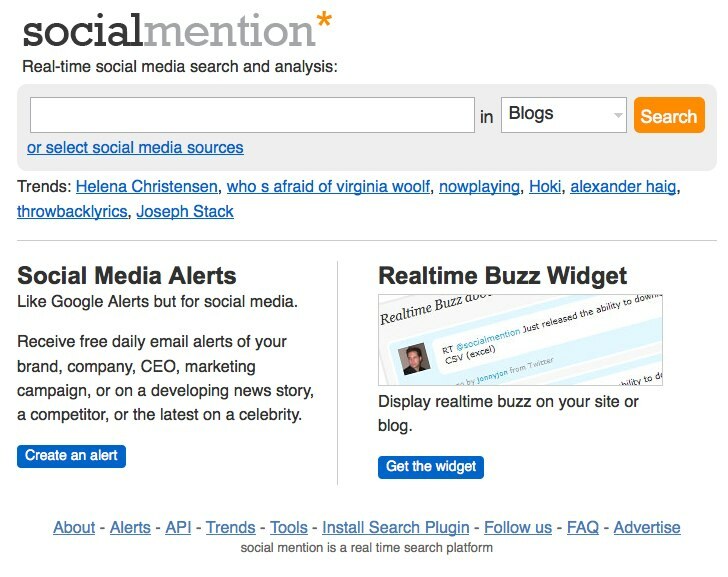 I’ve started playing around with Social Mention already, which I’ll write about in another blog post. Viral Heat also seems interesting, so that will be the next one. Stay tuned, all you nerds out there. Jason Sadler rents out his torso as a billboard. At his web site I Wear Your Shirt, companies, organizations or just regular folks like you and I can hire him to wear a T-shirt sporting our brand. Jason wears the shirt for a day in Jacksonville, Florida, where he lives. He uploads videos to YouTube, posts and chats to his community on Twitter and Facebook, and hosts a daily chat about the shirt and the sponsor at UStream.tv. His videos are like those long-length knife set commercials you see on late night television, only much more fun and not so blatantly about making the sale. Sometimes his audience can win prizes when they leave their own posts mentioning the brand, helping the name to spread. His pricing model is as simple as it is serendipitous. Two dollars for January 1st, $4 dollars for the January 2nd, increasing by two dollar increments every day. So December 31st comes in at a whopping $730. Last year it was half the price, but Jason doubled his staffing in 2010 with the addition of Evan White, who parades his T-Shirts around Los Angeles, California. Most of Jason Sadler’s customers are indeed “Kleinvieh,” not your big major marketers by any means. But I think it’s cool how the connectivity of the social web can make a micro-scale business idea like this even possible. Jason earns some pretty good income, and small businesses, with small budgets, get to trigger some potentially significant word of mouth. Hmmm. Maybe I’ll hire Jason to promote this blog. I’ll have to wait till next year though. January through August 2010 are already sold out. And more than 200 bucks would break my budget. And then there’s the T-Shirt. 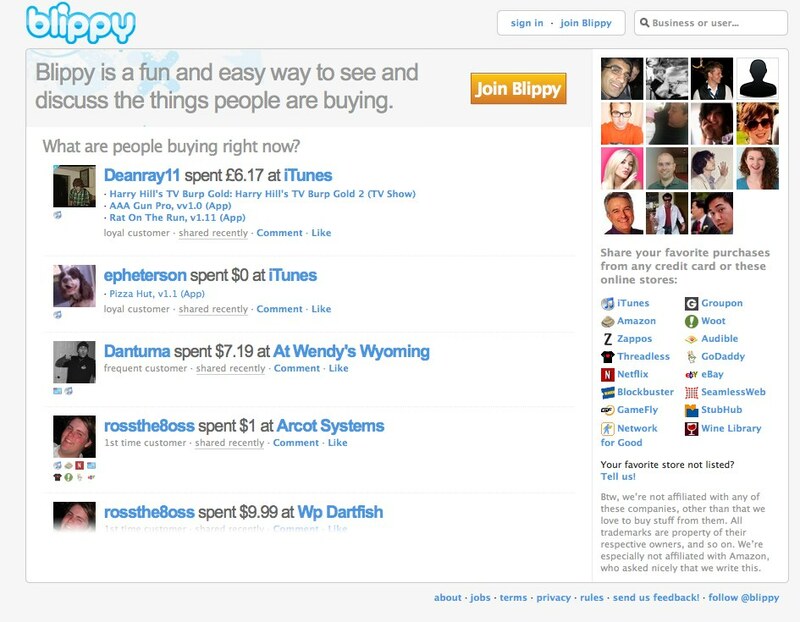 I just checked out Blippy, which, if you’re a cynic, you might just think of as place for a new consumer segment — the shopping exhibitionist — to indulge a perverse desire to show the whole world every purchase they make. When you register a credit card on Blippy, your purchases show up on the Blippy feed. It looks a lot like a Twitter feed except the only thing it says is “So and so” (that means you) spent “so much” at “such and such a place.” It also shows a list of what you bought. You can imagine what kind of trouble that could get you into. But like most social media sites, you can limit who sees and who doesn’t see that you just spend $180 at the Filene’s basement designer wedding gown sale, even though you’re a guy. I don’t quite know what to make of Blippy. But it has some cool functions. You can follow and be followed, so there could be value in keeping tabs on people who make frequent purchases in the same categories you do. You can click on people to see a record of their purchases. Or you can click on a location to see a list of everyone on Blippy who bought someting there. You can also comment on purchases, which might include tips on where the person might get the product for less the next time, or make suggestions of related goods that might interest the buyer. Apparently there’s no revenue model yet, but one can imagine that the data collected here could be a gold mine for retailers to connect with their most loyal and valuable customers. Check out this New York Times article for more information. I learned a new term there. It’s called passive sharing. That’s what Blippy does because your posts are automatically uploaded every time you buy something with the designated credit card. If you’re not careful, that really could get you into trouble!! !